Paella Sunday today is taking place in Port d'Alcúdia, at the very scenic Restaurant Miramar. Walking down the Port it's hard to tell which of these Seaside Restaurants is best, so we asked one of our Mallorcan friends to let us in on a tip! 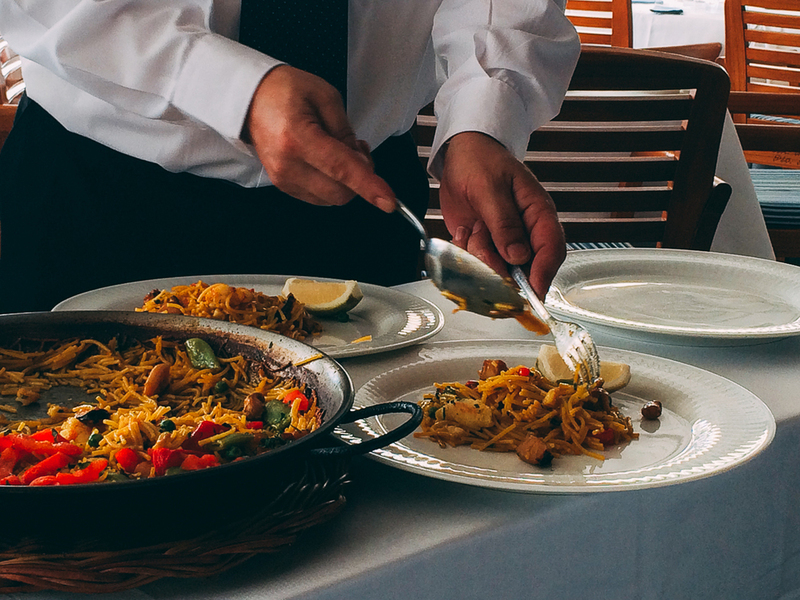 Most locals dine at home on Sunday with their extend family, and it involves a lunch that is hours long over a Paella or Fideuà. Usually the mother of the house spends her day preparing for this meal and will cook the feast. But what happens when you're busy, or you simply do not want to spend your day off over a hot pan? You call Restaurant Miramar and special order a Paella to go! My family here on the island consists of myself and The Chef, and cooking Paella for 2 is time consuming and well... it's probably our day off too! We were in the neighborhood of Alcúdia one afternoon and decided to try our friends recommendation. We called ahead as it gets busy in the high season and requested a table on the front terrace. The Restaurant also has an upstairs terrace we views of the whole Port! The waitstaff here is extremely attentive and quick on their feet, after ordering a glass of white wine and beer we prepared ourselves for the feast. We have been on a Fideuà kick recently and since I was wearing a white shirt we decided it might be best to have the seafood out of their shells. Usually I would not recommend the "Naked" Paella or Fideuà, as the seafood tends to retain more moisture with it's shells intact. Miramar's version was not dry at all, and the Gambas de Sóller remained juicy, plus they add more vegetables. Overall I left fully satisfied and stain free! LTM Tip: You aren't craving a giant Paella?! This Restaurant also serves whole salt baked fish and after we ate our whole Paella, we were salivating at these fish that were coming out in rapid pace. If you go and try the whole salt baked fish, let us know! Or... call us and we'll join you.